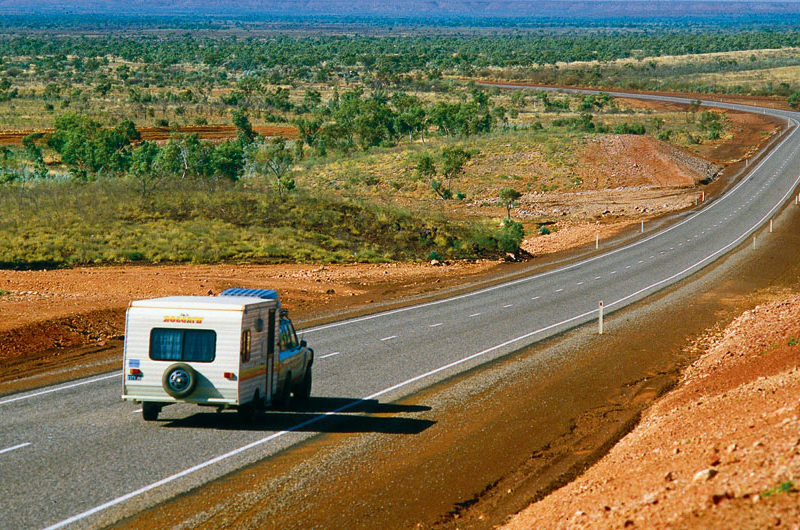 Thinking of joining the ever-increasing number of Aussies hitting the open road with a caravan in tow? Here, then, are the Top Ten things you should know before pulling into your first tourist park. People in caravan parks like to rise early. They have places to be and they need to get there ASAP. I know, I know, they’re on holidays – but there’s no rest for the wicked and the early bird gets the best site at the next van park. Plus, many caravanners are older retirees and they’ll be the first to tell you they usually wake by 5am anyway. So expect a lot of clatter and banging, car engines starting and loud morning greetings before the sun is even in the sky. You may dream of quiet nights in a tranquil bush setting with a book and a folding chair, but while that can happen if you head off the beaten track, most of the time you’re on a small site (grassed, if you’re lucky) with another caravan a few feet either side of you. Quite possibly one behind as well. Most have flimsy walls and lots of open screens, so sound travels a long way. Your own conversations, and those of people around you, will bounce around your not-so-quiet oasis for all to hear. Build in bed in 4WD. Backpacking Australia with camper van. And that’s before the lights go out and the snoring starts. You can hit your own husband (or, to be fair, wife) when they start to grunt and snort, but you can’t do much about the foghorn five caravans down. Caravan parks are like mini theatres, with an ever-changing cast and crew watched by an openly curious, often downright nosy, audience. New arrivals are like a new set of actors taking the stage. Oldies sit at their outdoor tables and stare as the latest travellers struggle to reverse their vans, maybe exchanging a few harsh words to each other in the process. A good domestic during the treacherous setting-up-of the-van process can brighten any caravan park afternoon. If you’re young and appear inexperienced, so much the better. If, like my husband and I, you’re still in your 30s and on your first long-haul caravan journey, you’ll draw plenty of attention. Try not to show fear. We humans often follow a fairly set routine when it comes to eating and, um, expelling our waste. The post-breakfast trip to the amenities block is, therefore, never a pleasant experience. Often there’s a queue and the toilets invariably stink. A motor home is set up, ready for camping in a quiet, secluded part of the Australian bush. There are also all those embarrassing bodily function noises emanating from the cubicles while those in line cringe and await their turn. 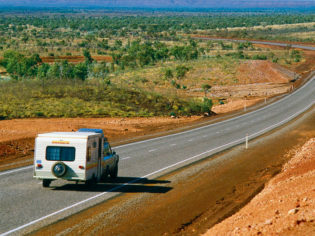 There are tens of thousands of people currently on the road around Australia. Many of them have lapped the country more than once and, let me tell you, they know a thing or two (or three or four) about caravan travel. They know where the cheapest petrol is, where the best views are, and which places not to bother with. And they won’t be backwards in coming forwards when it comes to telling you the things you should be doing or shouldn’t have done. There’s no solution to this. Just nod politely and agree. Living in a confined space for an extended period will test the strongest of relationships, no matter how much you love your partner. Especially if your chosen mode of transport is lean (in our case a 12ft, 26-year-old caravan). Being with someone 24/7 can be tough, especially when you can’t move from one side of the van to the other without crashing into each other. Tension between couples on the road is the subject of many jokes. Expect it and do your best to create space when it’s needed. The other alternative is to have a good old fight and add to that afternoon’s caravan park entertainment (refer to Point No. 03). No matter how well laid your plans, things will invariably come undone from time to time. The caravan park you want might be booked. Your warm tropical week in northern Australia might be windy and rainy. You might blow a tire or your vehicle might suffer some other type of mechanical problem. Be prepared and stay flexible. Throwing the odd tantrum sometimes helps, too. Washing and drying clothes when on the road can be a difficult chore to complete, especially when the limited number of clotheslines and driers seem always to be full. A campervan passes beneath the memorial arch on the Great Ocean Road in Victoria. The scenic road winds down the coast of Victoria and is popular with tourists. Unless you’re one of the aforementioned early birds, my advice is to wash at night. Get in and hang your clothes up way before the sun has come up. Before we began caravanning, my husband and I complained about caravans driving below the speed limit and holding up long lines of cars. “Bloody caravanners,” we’d been known to mutter. Now we are one of those moving roadblocks. We drive carefully and usually sit just under the speed limit, not because we have to, but because we get better fuel consumption that way. And with petrol one of the biggest on-road expenses, I guarantee your hooning days are over once you start towing a caravan. Of course, some people do take this concept to new levels, crawling along at a snail’s pace . . . bloody caravanners. Despite points one to nine, nothing beats the freedom of the open road; the sense of adventure and fun as you explore new places and the flexibility that comes from taking your accommodation with you. Australia is a fantastic country full of beauty and diversity and there are lots of great people to meet. Don’t put it off. Hook up that caravan and hit the road. What a terrible photo. At least demonstate driving on the correct side of the road. These are some great tips, and I appreciate your advice to get up early when on a caravan trip. My husband and I just purchased our first one, and we’re excited to take it out on the road. We’ll definitely try and get up early so we can get the best spots at caravan parks. Thanks for the great post! You’re welcome. Enjoy your adventure. Maybe you can add some more, Robyn? Nice one, Grant, We’ll try that one over the holidays. Wonderful article, very accurate on the points you made. We are looking forward to returning to the road as retirees after many years. Our last adventure, of the great outdoors, was when our children were young. Thanks a lot for the memories this evoked. I love your realistic, down to earth view of the caravan life. I must admit, I have thought that the above might be the case. I think I would have a huge adjustment to make if I decide to become a caravaner. I love my privacy and space. It did make me laugh though ! !